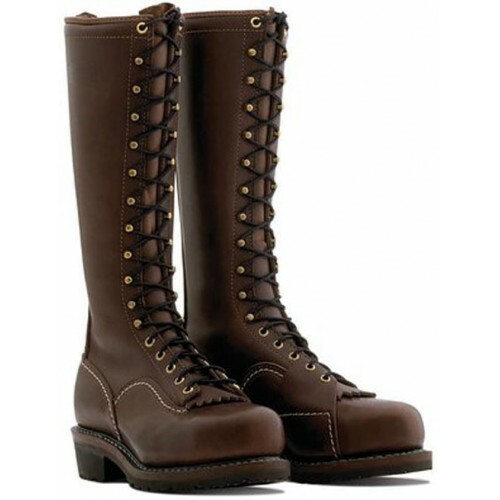 The brown Voltfoe is one of Wesco's finest leather boots. Climbing and navigating electrical poles will be made much easier with these lineman boots. Work boots can be hard to come by for people who have specific needs in their boots. Electricians, linemen, and others who work around electricity can have a difficult time of it finding footwear designed with their safety in mind. This lace-to-toe boot by Wesco is the answer to your prayers. Meeting the ASTM F2413-05 MI/75 EH PR and CAN?CSA Z195-09 standards, this climbing boot works to reduce the dangers of working around electricity. These tall boots come with a 109 Vibram sole, which is puncture resistant; so nails and sharp objects will have a hard time damaging your foot when you are wearing the Voltfoe. Extra safety is never a bad thing, and Wesco has spared no expense in safety by using seven ounces of full-grain leather to these boots. 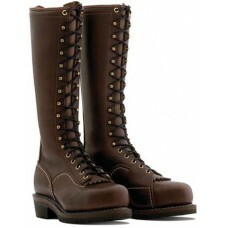 A non-corrosive, arched steel shank is also present in these boots to comfort and support your feet. Climbing anything, whether it be electrical poles or trees, can put a lot of stress on your feet, leading to injuries. The steel shank works to reduce the load on your foot and help reduce stress to your arch and heel. These working boots also come with a composite toe, which will help prevent anything landing on your boots from injuring your toes. Double full-leather insoles are also implemented to further reduce stess on your feet while you are up and about. A full-leather welt construction means water will have a difficult time getting into your boots, a good thing for electrical work! The Voltfoe is a fantastic boot for electrical work, but this boot is also versatile and can be used for any variety of other functions. For those looking for a tall boot that protects all around, this boot is hard to beat! Check out the black Voltfoe boot if brown isn't your thing!